Bend delicate and standard materials to 40 deg with minimal to no marking using CleanBend press-brake tooling dies from Mate Precision Tooling, Anoka, MN. 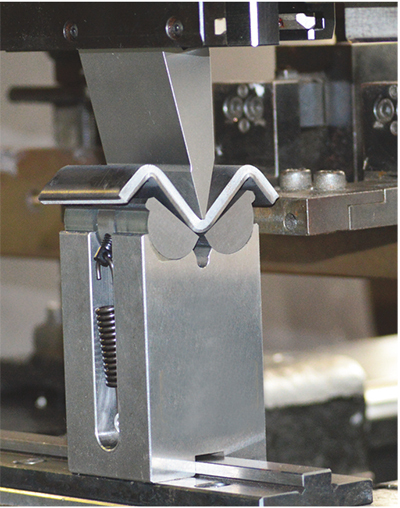 Using rotating supports within the tooling, the new tooling enables precise bending for the high-quality sheetmetal forming, according to company officials. CleanBend tooling is designed for a range of applications such as bending short flanges; bending a flange to a diagonal sharp or across existing holes; and bending delicate and highly polished materials including painted, coated and plastic-covered. The tooling is made from high-speed tool steel and is available for press brakes configured with European Precision, Wila, Trumpf and American-style systems in a range of sizes, from 8 to 30 mm. See the CleanBend in operation at www.youtube.com/watch?v=wANZFc3HTOs.